Have you noticed large icicles forming along the eaves of your roof? This may be a sign that your roof may be at risk for ice dams and all the associated damage that they bring. Problems with an ice dam roof can vary greatly: from torn off gutters and falling shingles to peeling paint, ruined flooring and stained ceilings, if the water gets into the house. Another highly undesirable consequence is wet attic insulation, which will likely loose its R value, and cause serious mold issues. To avoid all of these potential troubles, it is essential to focus on preventing ice dams. If you are a DIY inclined homeowner, you can buy and install most of these products yourself, or hire a contractor. However, average ice dams / roof snow removal will set you back at least $750. Prices in Massachusetts during “snowmageddon of 2014” went above $1400 for a roof snow removal! Here are 10 the best, tried and true products that you can use to eliminate or minimize ice dams. If you have lots of soft fresh snow on the roof, it’s best to remove it before it melts and subsequently freezes, forming ice dams. One of the most efficient tool to do this is with a snow rake like the Avalanche. Avalanche is easy on the back, and can be used by older homeowners! The Avalanche is very easy to use, and requires very energy remove large amounts of snow off the roof fast, even for older homeowners. 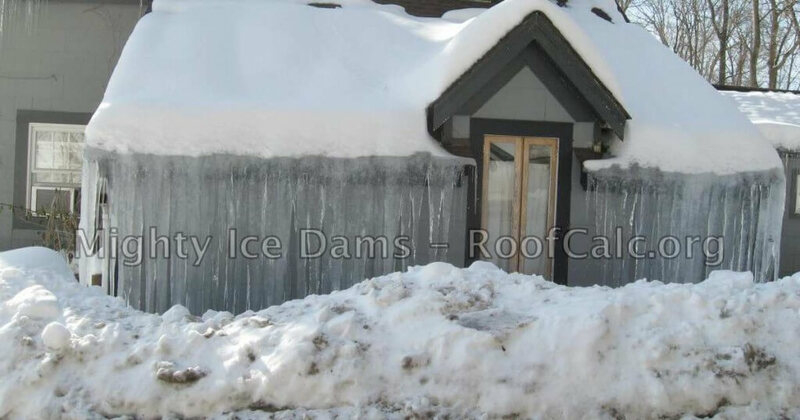 An ice dam is a solid ridge of ice that forms along the edges of your roof. Once this thick ice forms, it prevents melting snow from running off the roof. Snow starts to melt in certain areas of the roof, which are warmer than others, due to heat loss from the attic. As the snow melts, water runs down the roof, and when it gets to the edge (eaves) of the roof which are cold, it once again freezes. As more and more water freezes along the eaves, ice builds up, creating ice dams. As even more water runs down, it now has nowhere to go, so it backs up under the shingles, and leaks into your roof. Sometimes this backed up water can travel as much as 5-10 feet under the shingles. In general, the steeper your roof, the more thick an ice dam would have to be to cause damage. Conversely, the flatter your roof, the more susceptible it will be to ice dams. 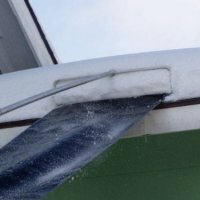 An ice dam can form when certain parts of the roof get warm enough to melt the snow on the roof, while the roof edges remain much colder, and as a result prevent the melted snow from flowing down the roof. 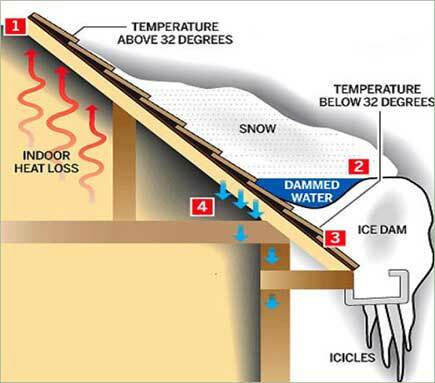 For an ice dam to form, the “warm” parts of the roof generally need to be higher than 32 degrees F, while the “cold” areas of the roof need to be below 32 degrees F (this means that the outside temperatures must also be below 32 degrees F). These temperatures need to be sustained over a long period of time in order for the ice dam to solidify and grow. What this means is that if your entire roof was always cool, you would not have any ice dams. The main reason for these uneven heat spots in your roof is lack of proper attic insulation AND roof ventilation. 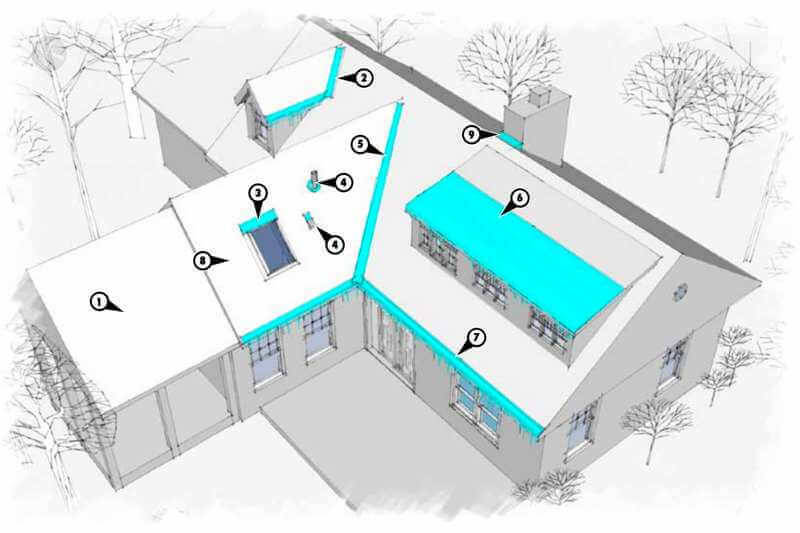 Heat can escape to the roof naturally through convection (hot air rises to the top), as well as through air leaks. Moreover, kitchen and bathroom exhaust systems that terminate just above the roof can also cause these warm regions that melt the snow on the roof. Consequently, the best way to resolve all ice dam problems and make sure they never come back is to improve both your insulation and ventilation. However, due to structural and architectural limitations of most homes, its not possible to improve roof venting and insulation 100%, to the point where ice dams will no longer be an issue. This is why there are so many various cheap and expensive ice dam prevention systems out there. Because every house is different, ask a roofer which solution would work best for your roof. Here is a map of where ice dams are most likely to occur. You can use this guide to check for ice dams yourself. 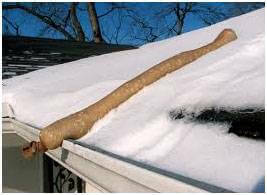 The number one place for ice dams is your roof eaves, but they can happen in many other spots. Note: Ice dams never happen over unheated spaces, such as sheds, garages, porches, etc. Once you have ice dams on your roof, your goal should be to eliminate them as quickly as possible to prevent any further damage to the exterior and interior of the house. Below we list immediate solutions and inexpensive products you can purchase and use yourself. Ice Melt Socks are easy to make and use. 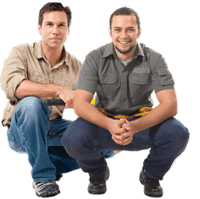 In most cases, they don’t require hiring an electrician or a roofer. All you need are some supplies and a ladder to reach your roof (with a stabilizer bar for safety). 1) A few pairs of nylon stockings. 2) A bucket (bag) of Calcium Chloride ice melt. Cut the “leg” part off the stockings, and fill them up with 2-3 pounds of ice melt and tie the ends. That’s it. Next go up on the roof, and put ice melt socks vertically, one end onto the gutter and the other end up the roof slopes, spacing them every 3 feet. The socks will create (melt) a channel in the ice to allow the water to run off your roof, instead of building up along the eaves and leaking inside. 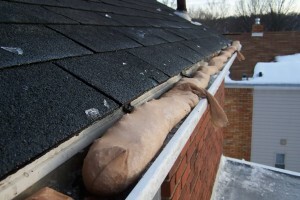 You can also place the socks into the gutters to prevent ice build-up there. Removing the snow off your roof before it melts and freezes along the eaves will minimize the effect of ice dams. The trick here is to get rid of as much snow as you can without causing any damage to shingles. This snow rake is on sale on Amazon, and it has two rollers on the bottom edge as well as plastic sheet to help snow slide off roof fast, so when you remove snow, it won’t damage the shingles. The lightweight solid aluminum construction makes this rake sturdy and easy to use by most people. If you are feeling like having a little workout, check this one out. We’ve created a Roof heating cable calculator which will help you estimate the length of cable you will need for your roof, all additional parts, as well as the cost for the whole project. It will also guide you through selecting the right length wire, as well as sizing the loop height, etc. This is probably the most “popular” or most sold type of ice melting heat cable, as practically every big box store sells it. HardwareWorld.com sells it for $61, while big boys like Home Depot, Lowe’s, WallMart, etc sell it for around $85 – so if you are up for paying an electrician, and saving some money along the way, grab this one. Keep in mind though that you WILL have to go up on the roof and install these in a zigzag pattern, on the lower 2 feet of your roof, and maybe along the gutters. So chances are you may need a roofer and / or an electrician. If you plan to do this yourself, make sure there is no snow on the roof, and use a ladder with a stabilizer bar (so it won’t slip on you). Also, take precautions not to make a short circuit. Your power outlet would be out of the water (preferably under the roof overhang). If you do not have an outlet, get an electrician to run a wire or two for you. When you attach ice melting cables to the roof, be sure to place fasteners UNDER the overlapping shingles – or you will make holes in the roof where water can leak. There are many things you need to be aware of when installing a roof heat cable, so first read the installation manual and watch some YouTube videos on how to do this the right and SAFE way. Also, keep in mind that a heat cable will use a good amount of electrical power, and it is not the best solution overall. If you hire a contractor that installs professional grade heat cables (240v) you are looking to spend $45-60 per linear foot of roof eave + around $500 electrician fee. An average home with a gable roof has 70 to 100 feet of eaves so it would cost you anywhere from $3650 to $6500 to have a heat cable installed professionally, plus the electricity cost to operate them. As we discussed earlier, the best way to get rid of ice dams is to eliminate the primary cause, which is heat loss in your attic. Moreover, you will make your home more energy efficient, and save money on heating and cooling. The easiest way to accomplish this is to add blown-in insulation. You can go to any Home Depot / Lowe’s / Menard’s store, buy 20 bundles of insulation and they will give (lend / rent) you a machine to install it for free. 20 bags is what it takes to insulate an average attic, and sometimes more. Also, insulation itself is not expensive. You can buy GreenFiber Blow-in Fiber Insulation for $12.15 at Home Depot and $12.76 at Lowe’s, per 19 lbs. bag, which has 40 sq. ft. coverage at R13 or 17.4 sq. ft. coverage at R30 which is standard for roofs / attics. Thus, to cover 1000 sq. ft. of attic space (horizontal) with R30 cellulose / fiber insulation, you will need 58 bags, costing you $705 + tax. 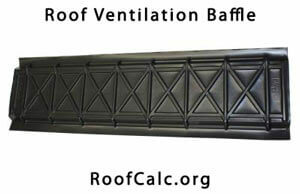 You will also need baffles / flutes to preserve soffit air intakes, for proper roof ventilation. For a hypothetical 25 x 40 attic footprint (1000 sq. ft.) you will need 60 baffles, costing $1.95 each. 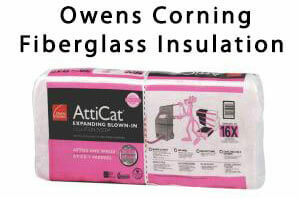 Alternatively, you can use Fiber Glass blown in insulation (such as the Owens Corning shown in the DIY video below), which costs $29.68 per bag at Home Depot. Similar John Manville (a Berkshire Hathaway company) fiberglass insulation sells at Lowe’s for same $29.68. 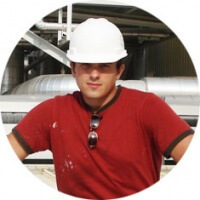 I personally like the Pink brand (Owens Corning) better, because it’s not as irritating on your skin as JM (in this case, I mean the rolled pink insulation with paper backing). The fiberglass insulation has 65.4 sq.ft. 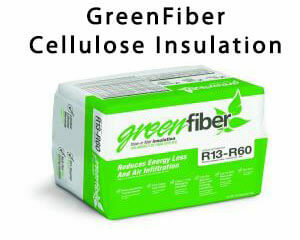 coverage at R30, so you will only need to purchase 16 bags, which will cost $475 (vs $705 for Cellulose fiber). However, to get the free machine rental you will still need to buy 20 bags, so your cost will go up to $600. But, on the up side, you will get an extra R value! Thus, your total cost for insulating the attic yourself for a hypothetical 1000 sq. ft. space is $720 – $825 + tax. Now if you call a roofer to fix Ice Dams, you will likely pay much more, depending on the actual issues and scope of work. The reality is you can’t stop heat loss completely. To preserve, maintain and prolong the life of your roof and wood substrate you need the ventilate the attic space. Most roofs have poor, inadequate ventilation, utilizing static box vents, gable vents, ridge vent only, or ridge + soffit vents with blocked soffit intakes (see portion in the Insulation section, talking about baffles). A few roofs have proper ventilation, while some have no ventilation at all. The most notorious roof types with poor or no ventilation are Hip and Gambrels. My own home has a hip roof with ZERO ventilation, but I used a breathable synthetic underlayment and a metal roof, so poor ventilation is not an issue. When it comes to ventilation you probably won’t be able to DIY this one, and will need to hire a roofer. Ask your friends if they know a reliable contractor, or you can use our Free Roof Estimate form to get matched with pre-screened local roofers. To install a new ridge vent (40 ln. ft.) with matching Ridge Cap shingles and 80 ln. ft. of soffit intake vents, will cost you about $1500, give or take. Note that if the space between your rafters is blocked, the soffit intakes will not work. Unblock them, and install baffles, to make sure they don’t get blocked again. Improved ventilation combined with adequate attic insulation should solve and prevent most ice dams, but even these two won’t work 100% of the time. 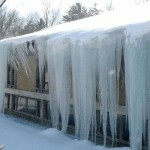 That is why we list the 3 most effective (and pretty expensive) methods to combat ice dams. The truth is, the best solution for ice dams is removing the weak point – an asphalt shingles roof. It is the design and the way shingles are installed that make them prone to ice dam leaks. Shingles are a water shedding system, which means water runs down the roof, and in that case, shingles work. As soon as water starts traveling UP, the roof leaks. This is exactly what happens with ice dams (water trapped by ice, travels up). If you switch to a continuous metal roof system, you will eliminate a way for water to get into your roof! But, metal roofs are expensive. If you do not want to install an entire new metal roof, you can put metal only where it is really needed to prevent ice dams – along the eaves. This is called Ice Belt Metal Panels. Ice belt metal panels are typically short (3-4′) and wide (2.5-3′), and are made of thin gauge aluminum. They can be field formed out of 24″ wide aluminum trim coil, used for siding, or professional made is a sheet metal shop. This does not affect the quality. The only purpose of ice belt panels is to shed ice and snow off the roof edge, and if Ice Dams do form, they can’t leak into the roof. The Ice Belt can be installed either directly over your shingles (not recommended) or by removing several rows of shingles along the eaves, installing synthetic underlayment (or ice shield), and then installing the panels. The first way will cost about $30-40 per linear foot of eave, while the second will be more like $45-60. This is the same or LESS than installing heat cables, does not involve an electrician and you won’t have to use electricity. So no ongoing expenses and no risk of short circuits or other “fun” electrical stuff. However, if your roof is pretty old, we don’t recommend installing an ice belt without replacing the whole roof. Otherwise in a year or two, when the roof is replaced, the old shingles will be torn down, and the ice belt will get damaged in the process. The most solid solution is to install a metal roof. While this is also the most expensive option, it will last the longest (50+ years typically). 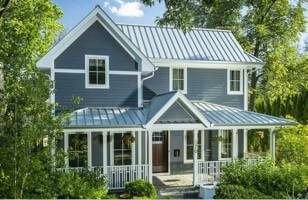 A metal roof does not need to be a continuous standing seam panel (like the one shown in the picture below). Stone coated tiles, metal shingles and corrugated (R-Panels) exposed fastener systems are all “Ice Dam Proof” with some exceptions (rare metal roof systems that do not have reverse lock on the bottom or sides). Unlike the other products on this list, a metal roof over the entire home WILL cost over $10,000 for most people. So it is not an economical solution at all, but it is well worth the extra expense in the long run. 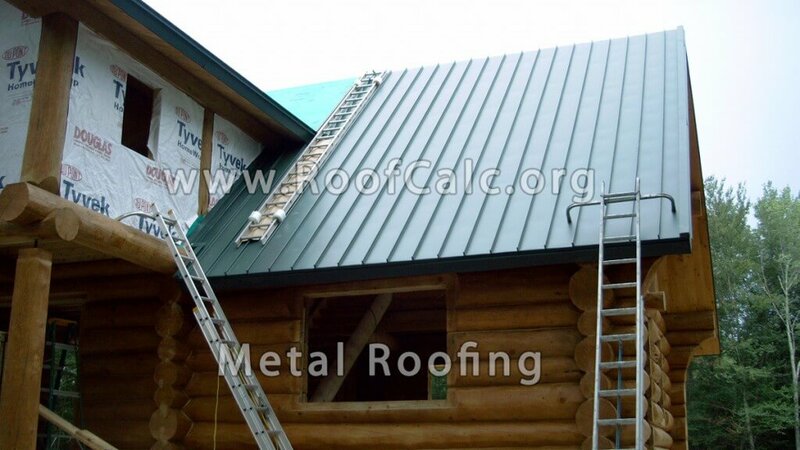 Use our metal roofing calculator to quickly estimate the cost of installing a new metal roof. An eave integrated heating / melting panels are effective at melting the ice dams, and the heating element is completely concealed. This is a professional grade product that will not break in 2-3 years. However, these are super expensive, will require at least an electrician, and in some cases an “authorized installer”. Finally, they will cost you more and more in electricity costs (same as ice melting cables). I’d only recommend these in cases such as “required for architectural purposes” or if no other solution works, and you need a long term integrated system, while burning electricity is not a big concern for you. Hot Edge heated drip edge – sold direct or installed by “approved contractors”. ZMesh – heated strips installed UNDER asphalt shingles. 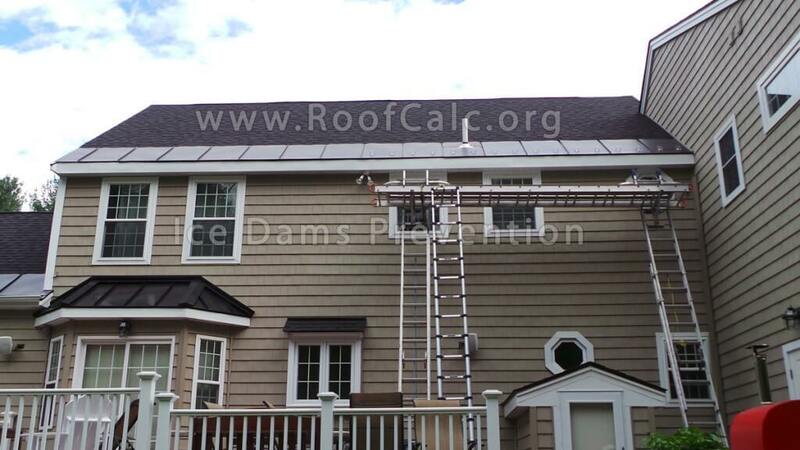 Sold by “Ice Dam Solutions” and installed by a network of local dealers. This product is the same as ice melting socks above. It is made from Calcium Chloride, and is sold online, or at home improvement stores. We put these as #9, because they are not very effective. They do not work as well as the “sock” and can easily be blown off the roof. These pucks do not require any work, except from actually putting them on the roof. Unlike the sock, they just melt ice around themselves, and do not create a path for water to flow down the roof. You will need to use many pucks to get the desired effect. This method is used by “ice dam removal” contractors. It is for extreme cases only, and should not be used on a regular basis. Moreover, it definitely falls into the category of “do not try this yourself”. From the list above, my favorite are 4, 5 and 6 – adding insulation, ventilation and installing Ice Belt metal panels or a new metal roof. 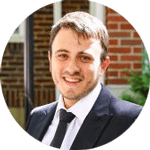 However, these are costly capital improvements and will in most cases require hiring a professional. But, unlike other solutions, these are permanent and will not cause ongoing expenses. If you find yourself struggling with ice dams every winter, you should consider one of the permanent solutions we discussed. As part of improving your house attic insulation and venting, its best to order a home energy audit. In most states, an energy audit is provided FREE OF CHARGE. A weatherization professional will come to your home and conduct a couple of tests to determine the weak spots (air leaks) around your house. For example, a blower door test can be performed to determine exactly how airtight your ceilings are. Moreover, he can use an infrared camera to pin point the places in your ceiling that are allowing for the most heat loss. The energy audit will also help you determine how much insulation you would need to add to your attic, walls, etc. Building codes in many snow country states require at least 12-14 inches of either cellulose of fiberglass insulation in the attic. If your roof is prone to ice damming, you may need to get more insulation. Good luck! Please let us know if this was helpful, and if we’ve missed some great product. Hi, I recently moved into a mobile home community. They already had heat cables on the house in the gutters. So i plugged them in during the winter. Anyway is there anything i can do so that i don’t have to use the cable to prevent ice damns? its really upping my electric bill using it. I’m in Leadville Colorado and have a metal roof, no gutter and a double pitched roof. It is a steep V-shape roof, with the majority of the roof being steep, guessing 45%), but then has a second, flatter pitch, guessing ~15% at edges for 5 feet to cover a porch on two sides. In keyboard strokes, it kind of looks like this, only not flat at ends of course. We get enormous amounts of snow, and much of it will slide off. Usually once a winter though, it will build up along that intersection of the two pitches and can create massive amounts of ice and snow that won’t fall. Price is not my top concern, rather getting a permanent, working solution, that won’t kill someone in an avalanche when the snow comes off. Would you use heat cables near the intersection? Or last 2 feet of the lower pitch? Or some other solution? Thanks! I could send a pic if helpful. This is a great question, and something that we deal with often, in various situations. So there are two things you can do. One – use the heat cables, as you mentioned. However, there are a few issues I see with this solution: first, heat cables use electricity, so you will have to pay to move the snow off your roof. Second, I don’t think heat cables will be very effective. They will melt snow / ice in direct proximity, but if you have 3 feet of snow, most of it will likely stay there. To be fair, heat cables are pretty inexpensive, so it’s worth a try, especially if you can go up on the roof yourself and attach them. It might actually work just fine, and you only need to turn them on, when you have a massive pile of snow up on the roof. The second solution is to prevent snow from sliding off the roof all together. I usually use either snow bars or clear acrylic guards like SnoJax / SnoBlox and screw them down with rubber washer screws and use SolarSeal 900 to make sure they don’t leak. If you are confident that your roof can hold massive snow loads, then I would go with snow guards of some sort. Good luck – let me know what you ended up doing, or if you have further questions. Leo, you are completely wrong!. We use UL Listed Self Regulating Heat Cable designed for ice and snow and is safely powered by electricity. This is not the cheap stuff found in retail outlet. Heat cable alone, will not solve ice dam issues. The only effective way to prevent ice dams is to use an engineered, heated panel design. Alpine Ice Solutions has special products to apply to eaves, valleys, and pitch transitions. We have hundreds of successful installations in Colorado like Grand Lodge Peak 8 in Breckenridge, 11,000 feet elevation. Secondly, snow bars and guards prevent snow slides, not ice dams. The only EFFECTIVE way to solve ice dams, is by using a metal roof. So even when you do get snow and ice buildup, it does not create roof leaks, because the roof is impervious to rising ice + water! That should be coupled with improvements in insulation and then ventilation. All other methods, including the cheap retail outlet heat cables, or your designer heat cables are a waste of resources and is utterly inefficient! 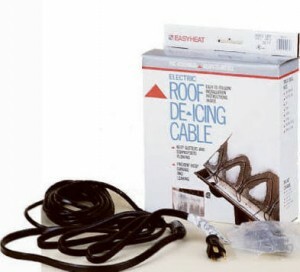 With that said, there are RARE situations when one must use heat cables due to roof shape, conditions, or local weather. All other situations can be solved with appropriate roofing materials and proper installation, making wasteful heat cables unnecessary. Heat cables are a band-aid! Keith, we specialize in ice dam prevention with our own heated panel design, manufactured in Denver, CO. Your application is very typical of roofs with pitch changes. We can solve your problem. Our solution is 100% guaranteed to prevent ice dams, and has a 10 year warranty. Send a photo to me and I will contact you to discuss how we can solve your ice problem. 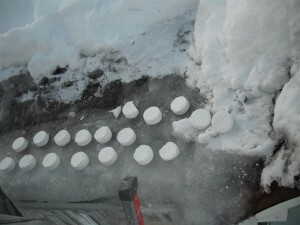 You say: “we” specialize in ice dam prevention. Who is “we” and how can I contact you? I also have an issue on a roof in Leadville and need a solution. 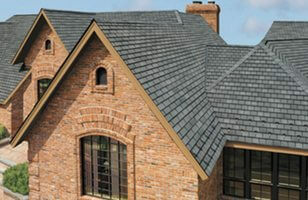 I am interested in your product for out metal roof. We live in Montana. I’m not sure which product you refer to. Most of them have links to manufacturer. We do not produce these. Do snow guards exacerbate ice damming? I have a ski jump side roof in which the upper section is in the sun and lower portion is generally in the shade. After a 30 inch snow, I believe the ice guards created mini-dams and each of the shingles above the snow gaurd rose about 1/4 to have an inch. The roof is 5 yrs old rubber composite shingles. The previous roof was slate with no snow gaurds and some avalanching between our house and the neighbor’s house. Can the ice dam socks be put on the roof before any snowfall occurs as a preemptive measure? If I have the ladder up to the second story to clean out the gutters within the next week or so it seems easier and safer to do it then. If there are heavy rains and you already put ice melting socks on the roof, the rock salt WILL dissolve by water and will run down into your gutters … so it’s best to put them up when it becomes cold. But it can still rain between you putting the socks on the roof and first snow. Also if your roof is very steep, the socks can fall off or slide down into gutters. While it is still “warm” out, you may want to entertain the idea of ice melting heat cables. They are not that expensive to install or operate and will definitely cost less that fixing the roof and interior damages if ice dams create leaks.